Please Click on the Banner Above For More Info and To Order Your Tickets Today!! ﻿﻿Children and Adults beware for your worst nightmares are about to come true. Yes that Right! Ghosts and Goblins, Vampires and Zombies, Serial Killers and Space Aliens, Ghouls and Creatures from Every Corner of the Universe are about to descend upon Orlando once again for it is that time of the year. 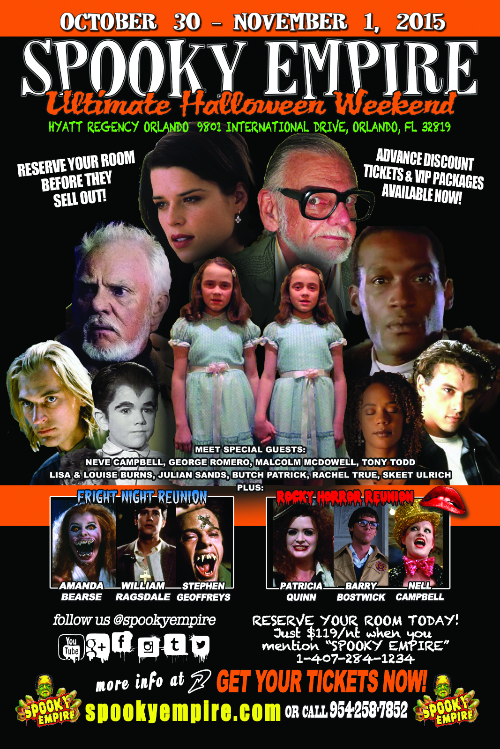 To ring in the Halloween Spirits, Petey and Gina Mongelli bring together the most freakish and awesome annual gathering of spectacles you can imagine and you’re invited to attend the 2015 Spooky Empire Ultimate Horror Weekend at the Hyatt Regency Orlando on International Drive. That’s Right, A New Hotel with Plenty of Parking!!! Celebrity List confirmed so far. To find out more and order tickets for the 2015 Spooky Empire Ultimate Horror Weekend go to www.SpookyEmpire.com today. Hope to see you there; I’ll be in the front row with my camera. Happy Halloween! Please Click on the Poster Above For More Info and To Order Your Tickets Today! !